Sarah Nader- snader@shawmedia.com Kristina Psitos (center) dances and sings a song about nutrition while hosting the "Jump with Jill" presentation at Ringwood School Tuesday, April 1, 2014. The rock & roll nutrition show has performed over 1,000 shows and encourages students to eat healthy and stay active. Sarah Nader- snader@shawmedia.com Ringwood School students, Anthony Galati (left), 6, Micayla Wacaser, 7, and Joseph Fernandez, 7, were brought on the stage during the "Jump with Jill" presentation at Ringwood School Tuesday, April 1, 2014. The rock & roll nutrition show has performed over 1,000 shows and encourages students to eat healthy and stay active. Sarah Nader- snader@shawmedia.com Kristina Psitos (center) gets students pumped about nutrition while hosting the "Jump with Jill" presentation at Ringwood School Tuesday, April 1, 2014. The rock & roll nutrition show has performed over 1,000 shows and encourages students to eat healthy and stay active. 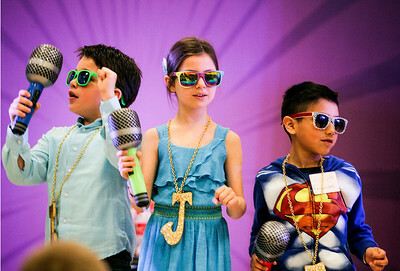 Ringwood School students, Anthony Galati (left), 6, Micayla Wacaser, 7, and Joseph Fernandez, 7, were brought on the stage during the "Jump with Jill" presentation at Ringwood School Tuesday, April 1, 2014. 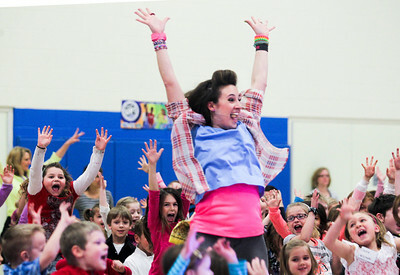 The rock & roll nutrition show has performed over 1,000 shows and encourages students to eat healthy and stay active.